Taste test: These have sort of a toasted onion taste, without very much cheese flavor to speak of. I was hoping for a lot more cheese taste. They're OK but not great. Smell test: Kind of oniony, but not sweet onion. Not that good. 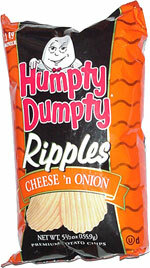 Trivia: Humpty Dumpty chips are sold at Olympic Stadium in Montreal.